MIT researchers are developing a new way of bringing augmented reality tech to your TV, so you can watch more than what is just playing in front of you, using a mobile phone or portable device in combination with your telly. The tech is called 'Surround Vision' and uses footage taken from different angles, which means that when you point your phone towards the side of the screen you can see the additional content. The use case for this type of tech is clearly compelling. If you are watching a football match, for example, you might want to use your phone to have a look around the rest of the pitch that you cannot see on the screen. "This could be in your home next year if a network decided to do it," according to Media Lab research scientist Michael Bove. 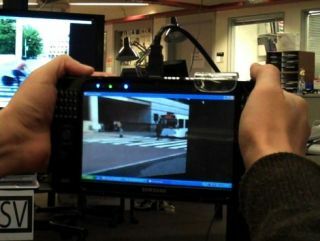 MIT's Surround Vision prototype adds a 'magnetometer' (a compass to you and me!) to a phone, as the accelerometers in most phones are not sensitive enough to detect the slight differences in moving your phone to the left or right of your TV. You can see the tech demonstrated in MIT's video – with the future of TV being shown off by Santiago Alfaro, a graduate student in the lab who's leading the project. Alfaro says MIT Media Lab will be testing the system using sports broadcasts and children's programmes. This is certainly a tech that has a lot of potential and we will be keeping a close eye on developments at MIT in the coming months.